Will Iniesta start? Or will he be given a breather? "Morocco have conceded just twice and given all we’ve said about a temptation for lacking some ambition here, Spain will be in no hurry to try and be aggressive. And they’re unlikely to concede themselves. Their back five reads like ‘who’s who’ a of top European defensive talent and were in good nick during the week." Two very contrasting games from Spain so far. An end-to-end 3-3 draw against Portugal, probably the game of the tournament so far. Followed by an exhibition of pragmatic football where they were on top until they scored and then decided that 1-0 would do just them fine and did their best to just manage the lead. All well and good but it could have gone badly wrong. Iran not only had a goal disallowed (rightly, admittedly) but had a few other chances as well. Still, it's the end result that counts and they're in an excellent position to go through, tied with Portugal on points, head to head and goal difference. Plus number of goals scored. There's a lot to like this about this team but one area they might need to address is where the goals are going to come from. Diego Costa is an excellent player but his record in every way (goals, discipline, fitness) suggests that his purple patches don't normally last that long for him. But the winner market doesn't seem too worried about that. Given they're almost certainly in the next round and that no-one else (bar Belgium) has really impressed, they're now the [6.0] favourites. 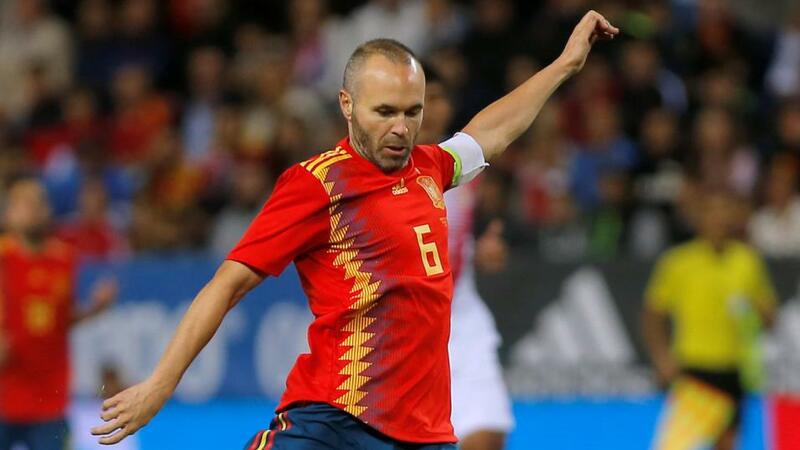 Andres Iniesta may get a break or play a part as a substitute. He's no spring chicken and they they'll need him as fresh as possible in the next round, assuming they qualify. Given their squad and what else we know about them, they probably deserve to be the jollies. But Hierro will still have to prove he can make the right calls at the right time under pressure. As teams will continue to drop out, few will feel as hard done by as Morocco will. They lost to Iran after not even conceding a shot on goal- it was an own goal - in a game where they should have won 1-0 or 2-0 themselves. They then did everything but score against Portugal. Some poor finishing, a little bad luck and some resolute defending prevented them from getting a crucial equaliser and two straight 1-0 defeats means they're out. If you were to be critical, you could say that both goals conceded could probably have been avoided and that they had enough chances (28 shots across those two first games) to get at least one of heir own, meaning they'd still be in it. They'll be doing their best to end up with at least a point to show for their World Cup efforts. Beware of the short-priced favourite who doesn't need to win. Spain are 1/3 to win this on the Betfair Sportsbook and we shouldn't be interested in that. Morocco were unlucky so far as discussed already and may just save their best performance for when the pressure is off. Fernando Hierro won't be too fussed about winning the group or finishing as runner-up because there's not much to choose between Russia and Uruguay, their potential opponents in the next round. The important thing for Spain is to not lose the game and if it's a draw after 70-odd minutes, they'll be just fine with that. And we all know how hard it is to get the ball off Spain when they're in possession mode. 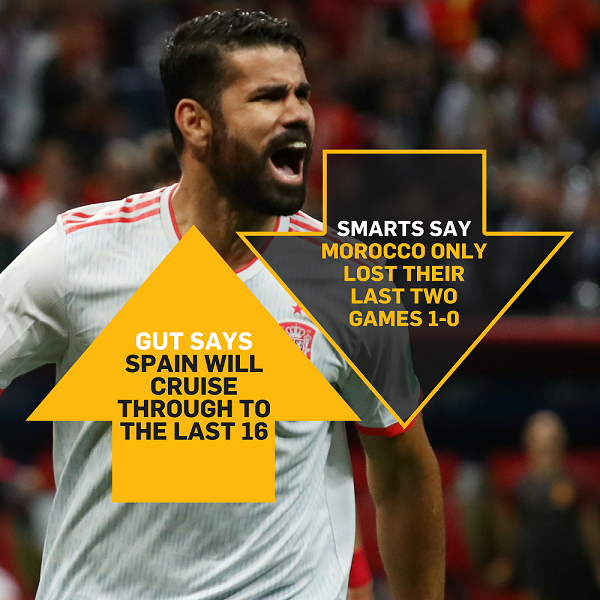 I advised a back-to-lay of the draw on the Exchange the last time Spain played and that strategy could pay dividends again. Morocco have conceded just twice and given all we've said about a temptation for lacking some ambition here, Spain will be in no hurry to try and be aggressive. And they're unlikely to concede themselves. Their back five reads like 'who's who' a of top European defensive talent and were in good nick during the week. 0-0 and 1-0 are two very lively runners here. Cover them both by going under 1.5 goals. This isn't a market I normally pay much attention to but I simply can't believe Sergio Ramos has been priced up at 24/1 to be considered the best player on the pitch. If Spain keep a clean sheet, whatever the final outcome, he will surely have played a big part in that and let's forget he's not adverse to getting forward and trying his luck at the other end. He's come close on a couple of occasions already. Let's not forget this a man with 68 career goals to his name. Spain and Morocco have faced other just twice before – a two-legged qualification play-off for World Cup 1962, with Spain winning 1-0 away and 3-2 at home. The Spanish are [1.37] to win. Spain have won three of their four World Cup matches against African opponents (L1), scoring 11 goals and never fewer than two per game. They are [1.97] to win half-time/full-time. Morocco have lost just one of their last four final group stage matches (W2 D1), winning 3-0 against Scotland in 1998 - their most recent World Cup. A Morocco victory is priced at [13.0]. Morocco have already been eliminated from the 2018 World Cup; they have now been eliminated at the group stage in four of their five World Cup campaigns, only progressing in the 1986 tournament. The draw half-time/Morocco full-time double result is [19.5]. Morocco have lost four of their last six World Cup matches against European opposition (W1 D1), losing against Portugal most recently (1-0 in MD2). A 1-0 win for Spain is [6.4]. Should they lose this match, it will be only the second time that Morocco have lost all of their World Cup group matches in a single campaign, having previously done so in 1994. Spain are [1.95] to win to nil. Spain have finished top of their group in three of the last four World Cup tournaments (before 2018), the only exception in this run is in 2014 when they finished third. They are [1.62] to win Group B.
Spain have won their final group game in each of the last eight World Cup tournaments, a run stretching back to 1986. They are [3.2] to win both halves. Morocco have fired in more shots than their opposition in each of their last six World Cup defeats (v Portugal and Iran in 2018; Brazil in 1998; Netherlands, Saudi Arabia and Belgium in 1994). Over 2.5 goals is [2.0]. Striker Diego Costa has scored nine goals in his last nine international starts for Spain. Costa is [1.9] to add to his tally.